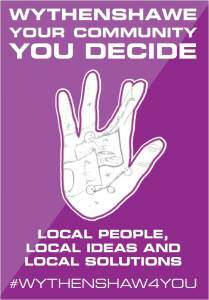 Greater Manchester Police (GMP) has begun the largest scale experience of Participatory Budgeting running in the North West of England. Embracing all 11 divisions of Greater Manchester, and working closely in partnership with Councils, Housing Providers, Voluntary and Community Organisations, Clinical Commissioning Groups, Fire and Rescue Services and in some cases private sector organisations. PBPartners, working on behalf of MutualGain have been running training sessions over the past few months and now the programmes are rolling out. Dedicated teams of PCSO’s supported by Inspectors and Neighbourhood Policing Teams are coordinating the 12 PB events, happening in December 2014 and January 2015. Over £150,000 has been made directly available to support these projects, but partners bringing match funding has significantly increased this amount. In South Manchester for example £30,000 of police funding is available in the Wythenshawe and Longsight areas, which has been matched by another £30,000 from the city council. In Wigan, where a programme is running on the Higher Fold estate, the council has matched the funding by £6,000. Alongside financial support considerable staff time, free use of venues, communications support is making the money reach further. Each Division is following its own format, so in Stockport rather than hold a single event they are taking the decisions out on the street asking residents which initiatives will reduce crime and improve wellbeing. MutualGain is ensuring that the learning is shared through regular action learning sets. PB Partners and MutualGain delivered their initial training to PSCO’s and Division leads at the Sedgley Park Police Training centre earlier this year, and since then local facilitation has developed the work into a range of different approaches. These will be compared and recorded using a mixture of video, evaluation forms and visual minute takers. "local community engagement has to be made a routine component of police work and a core responsibility of those elected to hold the police to account." The initiative follows many examples of the Police tackling crime through building stronger communities. Since 2008 numerous forces have experimented with PB, mostly using funding through the Home Office. Examples include the recently announced Seaham PB funded by the Durham Constabulary, and the Cheshire Police and Crime Commissioners programme earlier this year saw around 700 residents engage in making their area a better place to live.